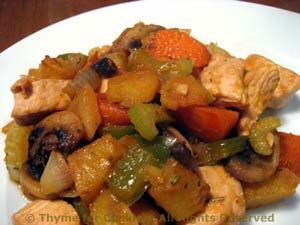 Chunky Turkey Hash, from Thyme for Cooking's Weekly Menu Planner. This is a catch-all dish. The vegetables and meat can be varied to suit what you have on hand. You can add any leftover cooked meat or vegetables. It's flexible, fast and full of flavor!